Today I am going to specify how to print doc to eps. We will use the virtual printer docPrint PDF Driver to print doc to eps. 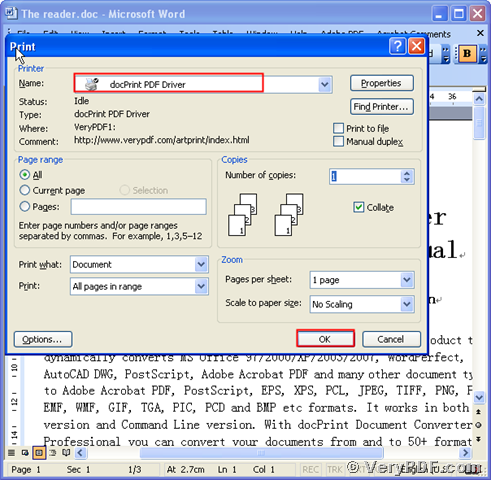 This virtual printer: docPrint PDF Driver belongs to the software: docPrint Document Converter Professional v5.0. So first we need to download this software. If you want to know more about this software just visit this website: http://www.verypdf.com/artprint/document-converter/help.htm. Then we can use the docPrint PDF Driver to print doc to eps. You see this virtual printer is very useful, it can not only print doc to eps, it can also print doc to eps and print doc to ps and so on. Here I will describe how to print doc to esp. And hope it is useful for your daily office work. Do remember to extract it when it is completed, for it is a zip package. Then unzip it. Install this software in your computer for the further use. You can use the trial version or register it. It depends on you. <1>, Open your doc file (The reader.doc)----click the “File”----click “print”, there will appear a dialogue “Print”. Then choose the virtual printer “docPrint PDF Driver”, then click the button “OK”. Please look at picture 1. <2>, it will pop up a dialogue “Save As”. Save this new file to your computer, for example save in “Desktop”. Input the file name in the blank. Choose the right type “EPS”. Then click the “save”. Please look at picture 2. 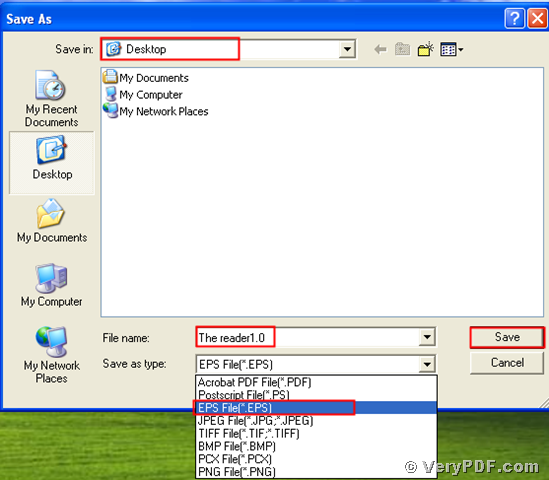 After you printed doc to esp, right now you need to open the before and after printing files. Please look at the arrow, you will easily find that we had printed the doc to eps. Because you see the format of them had changed into eps. Please look at picture 3. If you have any questions or doubts, please refer to http://www.verypdf.com/artprint/document-converter/help.htm. Or you can leave messages below this article. How to convert documents of HTML to XBM? This entry was posted in docPrint Pro and tagged doc to eps, docPrint. Bookmark the permalink.